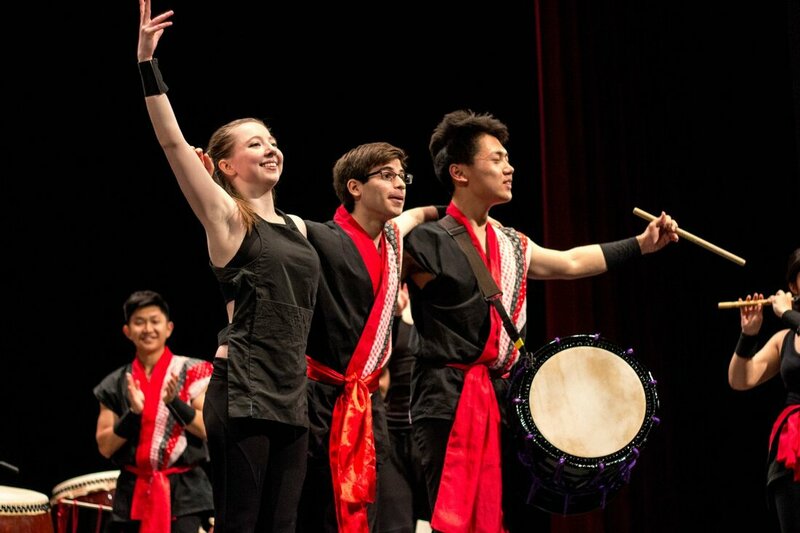 As a relatively young taiko team, Yamatai is energetically developing its individual style. Our current repertoire consists of pieces written by Bonten (a professional taiko group in Japan), traditional and community taiko pieces, and original compositions by Yamatai members and alumni. Through rigorous study and training, Yamatai seeks to explore musical possibilities of taiko drumming in contemporary adaptations while respecting the origins of the traditional art. We are excited to be a part of the growing international taiko community, and to share our passion for taiko with our audience! Yamatai was founded in 2006 by Cornell undergraduates Haruki Yukawa ‘09 and Eva Kestner ’09. Eva served as Musical Director until 2009 while Haruki served as President until 2008. With the help of Masataka Kobayashi-sensei of Bonten (a professional taiko group from Japan), Yamatai was able to get started. Kobayashi-sensei brought drums from Japan, helped make sticks and stands, and held a master class for Yamatai's first generation. Yamatai has been playing Bonten pieces along with traditional taiko pieces ever since. More recently, Yamatai has incorporated original compositions into its repertoire. The name “Yamatai” is a metaphor of pure, primal human energy that our ancestors possessed before civilization. It is meant to project the image of a tribe of fierce tattooed warriors, and beautiful female shamans with terrible supernatural powers. In that age, drums, music, and dance would have been a crucial part of a powerful old magic, one that would transform their men into gods of war before battle and bring about plentiful harvests. The intent is for the audience to feel, not necessarily on a conscious level, as if they had suddenly traveled two thousand years back in time, and were witnessing that magic. We hope for everyone to take home a little piece of that energy inside them, something that would change the way they lead their everyday lives in a very special way. Our logo was designed to capture the “pure, primal human energy” that Haruki had envisioned while still acknowledging that we as a team are constantly changing and moving forward. The goal was to make the logo timeless enough to follow Yamatai in whichever direction is chosen in the future, but still keep a sense of the primal energy from which we originated. The logo was created by taking the negative space of a mitsudomoe, a Japanese symbol commonly associated with taiko that represents Man, Earth, and Sky. The mitsudomoe was arranged such that a ‘Y’ is carved into the center. Our current logo was designed in 2013 with the help of Hiiro Tomita, brother of Eri Tomita ‘15. Hiiro is a Japanese-American artist living in California. He mainly concentrates on custom hand drawn New Era hats, but other art forms include tattoo designs, logo designs, and even architecture. Hiiro was very professional and patient throughout the logo design process.